The following content was originally created in this thread on Reddit in /r/bloodborne. All credit for the content of this post goes to /u/ninthbelief, with only minor changes being made to reflect the difference in format. Mergo's Wet Nurse, for being a potential final boss, is a bit transparent when it comes to the game's story. At a first glance, a lot of people chucked it up to FROM not wanting the player to be able to kill a newborn baby, and that obviously is a decent reason to have this otherwise out of place "Wet Nurse" character -- but the boss has a very, very strange "identity" that is alluded to through her defining characteristics. Her entire "body" is black-feathered and crow-like, even her hands resemble talons more than human hands, and she carries 6 swords in her hands (of which she has 8, curiously) -- at least 2 separate varieties, though it's hard to tell how many actually differ. Mergo, being a child of the Great Ones and most likely lacking a corporeal form, probably isn't getting milk from the Wet Nurse. Assuming the "Child of Blood" Annalise wishes for is the child of a Great One, we actually already know in theory what nurtures them -- Blood Dregs. Blood Dregs only come from beings that have amassed Blood Echoes (specifically "the blood of echo fiends. . . . the blood of hunters" in its official item description). What would be the best way to obtain the blood of hunters? Well, you'd hunt hunters, naturally. Annalise herself already realized this and that is seemingly the point of her entire covenant -- to go out, hunt other hunters, and bring back the Blood Dregs you obtain. 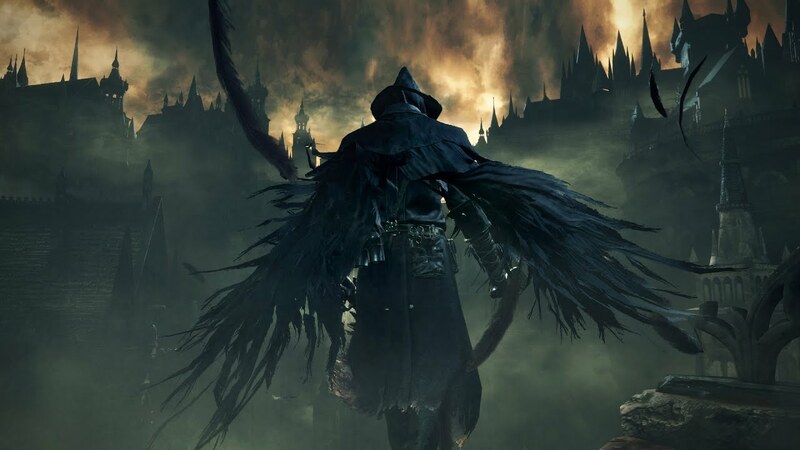 Notably, there is one character (known as the Bloody Crow of Cainhurst in the guide) who wears the Vileblood mask and the Hunter of Hunter's symbolic garb who you can fight during Eileen's questline. Judging from the item descriptions of the Crowfeather set, the helmet is the only part of the entire outfit that belongs particularly to Eileen -- that is to say, the rest of her garb and the Blade of Mercy mention within their descriptions that they are typical attire for the "Hunter of Hunters" in possession of the Crow Hunter Badge, and are not exclusive to Eileen. So what are a Hunter of Hunter's defining characteristics? The appearance and likeness of a Crow, and the asymmetric blades that are the Blade(s) of Mercy, noted as one of the oldest weapons in the shop and supposedly forged from the mineral of heavens, siderite. These two characteristics that immediately identify a Hunter of Hunters just so happen to also be the immediately defining characteristics of Mergo's Wet Nurse, and, assuming that what Mergo wants ­is in fact the blood of hunters, a Hunter of Hunters is EXACTLY the kind of "Wet Nurse" Mergo would need. is/was herself a Hunter of Hunters or is the basis for the conception of the Hunter of Hunters in the Bloodborne world. Additional Note: To avert any nay-sayers as efficiently as possible and to hopefully facilitate the advancement of the game's lore here, I'm going to tie a loose-end and say that Blood Dregs are actually (as far as we know) only seen by the Vilebloods of Cainhurst -- whether this is because they're specifically looking for them, or it's some kind of blessing Annalise has bestowed on them I think is most likely irrelevant to a Great One, and I believe wholeheartedly they'd be able to see it without specifically being related to the Vilebloods, though it's not necessary that they do for the sake of the theory. Blood Dregs alsohave spermatozoa-like organisms within the icon, leading a lot of people to believe that they are only for a Child of Blood's conception, which I also thinkis irrelevant -- in the very worst case scenario, Mergo's Wet Nurse is feeding Mergo sheer Blood Echoes and not Blood Dregs, which would be mostplentiful on hunters anyway. It's not necessary for the theory to stand on two legs that Mergo's Wet Nurse is feeding Mergo Blood Dregs, it's just mightyeasier for the sake of explanation that she is. This makes a lot of sense. I always thought of the Wet Nurse as a protector figure and nurturer, not a hunter of hunters. Mergo needs food, so killing the Wet Nurse essentially starves the baby while providing a fun boss fight. The symbolism of the clothing really sells her hunter-of-hunters role. However, using the Wet Nurse to feed Mergo with hunters seems risky, since she's not too tough of a boss. Maybe she fed Mergo the students of Mensis we see before her boss room? This also brings up the theory that the Moon Presence is eating our amassed blood echoes, much like The Old One of Demon's Souls. Are The Moon Presence and Mergo in competition for our hunter's body?